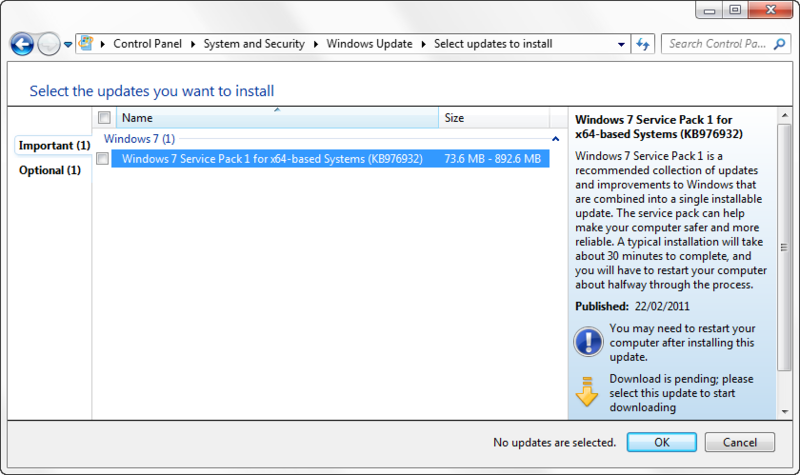 Maybe it’s just me, but the release of service pack 1 for Windows 7 ought to be a fairly big deal, but because this release coincides with sp1 for Server 2008 R2, the message seems to been a little lost and garbled. Not a resoundingly clear message about Windows 7 sp1 availability. So I checked my Windows updates which had a handful of Office things, the usual Malicious Software Removal tool update and a couple of vaguely worded items which I included as well. No service pack to be seen. Next step, search engine! 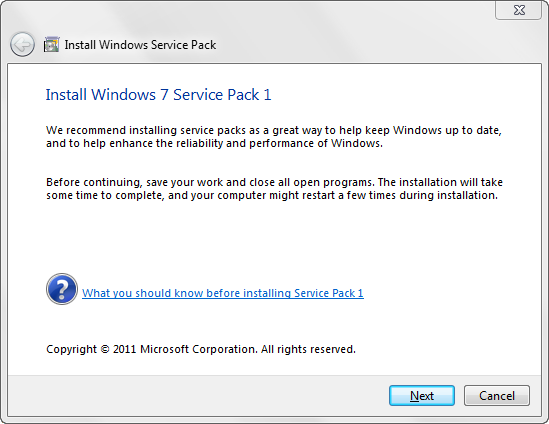 The first hit on a Google search for Windows 7 sp1 was a page which referred to a couple of ways to download and install it, but none of the links would work, because the page was for the OEM channel (and I am not an OEM partner). Probably useful for those who did want this page, less so for the masses who just want it installing. If you have several separate machines to patch, or are the kind of person who regularly rebuilds machines or VMs, or you are the de facto go-to support person for family and friends you may want to download the service pack so that you can run it from a USB thumb drive without any fuss or delay. Of course this is especially useful if you have good old dialup or a tightly-capped broadband connection. Of course if you are running an IT department with any kind of central control you should be using WSUS to control and push out updates after testing them first to make sure they don’t cause any issues in your particular environment. Be warned that these are pretty hefty – the 64 bit version weighs in at 925 MB, almost three times the size of XP sp3 and twice the size of Vista sp1 as a comparison. The Windows update route is supposed to take away most of this pain by only downloading bits you really need, but as described above there might be scenarios where it actually makes more sense to take the hit once. I have not bothered to download the full ISO to burn a DVD with both 32 bit and 64 bit on, since that was larger than these two added together. Nor have I bothered with the debugging stuff as I can’t see me using that realistically.